If captain James T. Kirk from the Star Trek series could come to the 21st century and help us develop biofuel he would likely bring with him one very cool piece of sci-fi technology, the Tricorder! SD-CAB scientists would find this fictional device particularly useful as it can scan living organisms and provide a wealth of information, including: size, shape, species, and molecular composition. With technology such as this one Scientists could even screen many different microbial mutants for, say, the molecular composition of their lipids. By doing so Kirk’s future sci-fi device would make it possible to find out how mutating various genes changes an organisms’ overall lipid profile to be more favorable for downstream biofuel production. Well, Kirk, you should probably just beam right back to the 23rd century, because SD-CAB has acquired an advanced piece of analytical technology that allows researchers to do just such an analysis. Roughly six months ago SD-CAB purchased a Gas Chromatograph-Mass Spectrometer (GC-MS). This instrument is commonly used in drug detection, environmental analysis, and anywhere it is necessary to specifically identify individual compounds in a complex mixture. 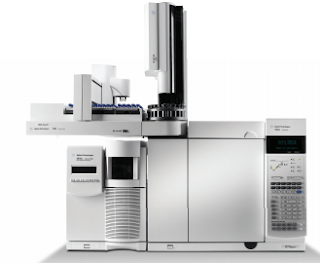 The principals of GC-MS operation are suggested by its name, as it is in fact the marriage of two common analytical chemistry techniques: Gas Chromatography and Mass Spectrometry. Assume you have a complex sample such as a bacterial extract. First it would be necessary to separate all the compounds in the extract from each other via gas chromatography. The machine first heats the complex mixture to a point that all of the compounds in the mixture vaporize. The compounds, now in the gas phase, travel through a very long (up to 60 meters) tube known as a capillary column. In this tube the chemical and physical properties of the compounds cause them to move at different speeds separating them from each other over the tubes distance. One can think of it like a marathon, where a large group of people cluster at the start but the different speeds and stamina of the individuals cause them to spread out and cross the finish line individually. As compounds exit the column they enter the mass spectrometer, and the analytical part of the process begins. Here each compound is hit with high energy causing it to fragment into a number of charged ions. The ions then pass through an electromagnetic field where they separate from each other. Finally, they impact on a detector that measures their mass and produces the “mass spectrum”. Here’s the cool part, almost every specific compound will fragment into the same ions every time. Thus, if you take the mass spectrum and compare it against a dictionary of mass spectra, it is possible to figure out exactly what compound you have in your sample. Also, because the GC-MS measures mass, not only can we identify the compounds, but we can also figure out how much is there. SD-CAB researchers have leaped into the future, quickly putting this new technology to use. 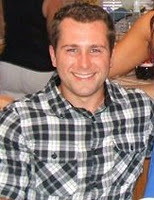 Will Ansari, a graduate student in the laboratory of Prof. Steven Mayfield, has been mutating random genes in the Chlamydomonas reinhardtii genome to look for mutations that change the lipid content. Mutants that show changes in lipid content are analyzed by GC-MS to determine if there are changes in the overall lipid profile. His project will hopefully identify genes that affect the lipid profile of these cells. Understanding how the genetics of Chlamydomonas effects what types of lipids it produces will help engineers design algal strains with better lipid profiles for biodiesel or other industrial products. Another SD-CAB graduate student, Christine Shulse of Prof. Eric Allen’s laboratory, has been specifically looking at the production of polyunsaturated fatty acids in bacteria (like the omega-3s we often are told to eat). These fats have high values as nutraceuticals, and may also be able to be produced as co-products during the synthesis of fuels or industrial chemicals. It was originally understood that only a small subset of marine bacteria had the genes necessary to produce polyunsaturated fatty acids, however Christine’s work has demonstrated that up to 10 different bacterial phyla have related clusters of genes, not know before, that likely perform the same process. The real mystery is that we do not know what types of fats these newly discovered genes are producing! Currently Christine has been trying to determine how growth conditions effect the polyunsaturated fatty acid synthesis. Using GC-MS she is identifying and quantifying the polyunsaturated fatty acids produced in bacteria under varying growth conditions. 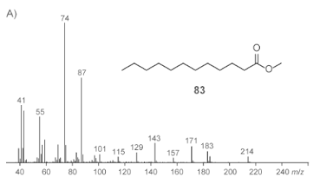 Future work in the laboratory will focus on many of the novel gene clusters discovered in her study, and use GC-MS to identify the different types of fatty acid molecules that are being produced by these novel gene clusters. As is evident from the above examples the GC-MS is an amazing device reminiscent of a sci-fi scanner. Unfortunately it still does not have the ability to translate alien languages or give telemetry data. Nonetheless, it looks like the future is approaching faster than we thought…Take that Tricorder!